Uema Ayano 上間綾乃. Visit her Facebook page and her YouTube page. To get a feel for what it means to be Okinawan, turn to their folk music, or Okinawa minyo. For me, a sansei in the U.S. with Okinawan roots, Uema’s performance provided the first real connection to Okinawa minyo. (See the YouTube videos below for examples of her music, especially 県道節 Kendoobusi.) Until I heard her sing, I couldn’t relate to the folk songs of my forefathers. They sounded strange and alien to ears that nursed on Bob Dylan, the Beatles, and Gabby Pahinui. Through Uema’s artistry, I began to feel the power and energy, the vibrancy, of the Okinawan soul as it reverberated through minyo. It sounded fresh and current, happening — not dead and long gone. With this introduction, I began to explore other Okinawan artists, and I’ll share what I’m learning in future posts. 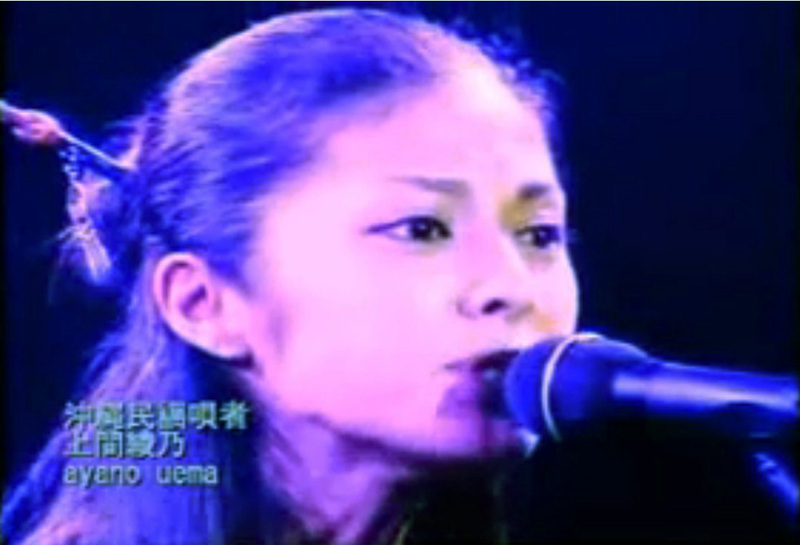 For background information about Uema, especially her albums, see “Ayano Uema: Uta-sha” (Power of Okinawa, 5.31.12). “かりゆし音楽祭／ヒヤミカチ節　上間綾乃” (Kariyushi Music Festival Uema Ayanao “Hiyamikachi Bushi” ヒヤミカチ節) uploaded by まじゅんプロジェクト on 2/24/12. Uema talks about her roots, about how she got into Okinawa minyo, or Okinawan folk music. Ayano interview with Bakabon Onizuka on “TheNuttyRadioShow Onitamashi” (NACK5 79.5 Mon 9/29/14, 21:45-22:00), added to YouTube on 9/30/14. REMOVED BY YOUTUBE. Added 6/5/15: “池田卓＆上間綾乃　二見情話 琉球もーあしびー沖縄・島唄ライブ2010” uploaded by tomo830 on 7/20/10. Added 6/5/15: “上間綾乃 Ayano Uema　沖縄民謡 デンサー節 Okinawan folk song Densa-bushi” uploaded by 上間綾乃専用 on 7/28/13. REMOVED BY YOUTUBE. Probably because it’s for a Japanese audience :). I’ve been following Uema’s music since I first heard her sing Soranju a couple years ago. Now I have all her music and think I know much about her roots and song. Recently on a trip to Okinawa, I stopped in a store in Chatan called the Sake Mart. I bought a bottle of scotch whisky and when I went to the counter to pay for my liquor, I saw a picture of Ayano above the register. I said to the old man at the counter, “That’s my girlfriend.” It surprised him when I said I know Ayano Uema. He laughed and said, “That’s my girlfriend too!” We had a common bond with each other. I’ve been back to visit the Sake Mart many times since then, and I always make a point to say hello to the old man. It’s just one of the things I love about Okinawa. I attempt playing the sanshin Jim. My sanshin was given to me back in 1990 from Mr Anshio Kushi of Ganeko. I was his son’s English teacher and I refused to accept payment from him for my services. That was 26 years ago, and when I visit Okinawa every year or so, I make a point of meeting up with the Kushi family for a dinner. Beautiful people and they treat me like family. Thanks for the post. I can’t believe you have a picture of my Sake Mart! Her voice, the samisen, and drums, fantastic, can listen everyday!